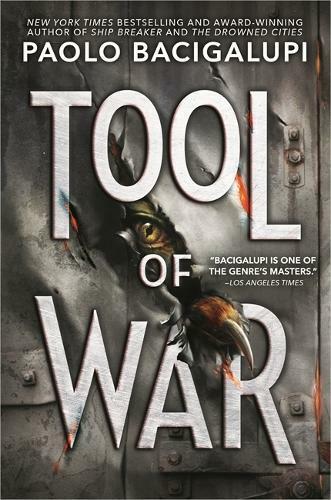 From Printz Award winner and National Book Award finalist Paolo Bacigalupi comes the third companion novel in the dystopic Ship Breaker universe. Set in a future swamped by rising seas, depleted resources, corporate government, and civil war, this novel stars the most provocative, most talked-about, most controversial character from Paolo Bacigalupi’s highly acclaimed books Ship Breaker and The Drowned Cities, and pulls no punches in exploring the gray areas between what it means to be human – and animal. An attack on the Drowned Cities leaves Tool, a part-human, part-animal super-soldier with heightened physical abilities, on the run. His pack of compatriots is destroyed, and his only allies are humans whom he can’t afford to trust. But now he must resist his bioengineered impulse of loyalty toward his masters and embark on an all-out war against those who have enslaved him.